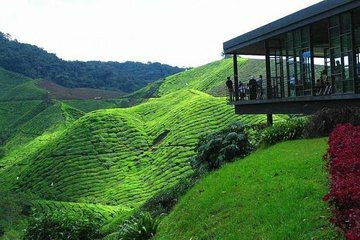 Evite las molestias de conducir y disfrute del encanto de Cameron Highlands con la experiencia de un guía privado. Visite granjas, mercados, una plantación de té, una fábrica de té y un jardín de mariposas. Aprende sobre la artesanía tradicional en una fábrica de cestas y descubre la vida antes de que la tierra sea limpiada con una demostración de cerbatana en una aldea indígena. El tour incluye el almuerzo y el transporte de ida y vuelta puerta a puerta. Obtenga información personal sobre la cultura y la comida de Malasia con un guía privado. Avoid this tour at all costs! It claims to be a ten hour tour - we were on the road for about 12 hours and didn't even get to visit a whole bunch of places that were promised on the tour. The traffic in Cameron Highlands was appalling which is a key part of the issue - when we got to the yummy lunch stop, we were told that, if we continued on the tour, we would likely be back at our hotel around midnight. Admittedly, we chose not to continue because we didn't want a 17 hour day with a very early morning planned for the following morning, but the tour company should be aware that what they are promising isn't able to be delivered the tour guide/driver told us the traffic happened every day and the tours always run overtime as a result. Anyway, below is a list of the places that are advertised to be visited. I've mentioned next to each whether they were or weren't. Aborigines Village Visit Stop Blow Pipes Demonstration - we visited an Aborigines Village. The Blow Pipes Demonstration was promised later in the day at a different location and at an additional cost. We ended up saying no because we knew at this stage that we were going to arrive late back in KL already. Like I said - save your money, this tour does not deliver what it promises. You will only walk away disappointed. Nice tour. Comfortable and pleasant trip.